Today we announced our summer 2011 RealArts@PENN paid internships. Click here for more. 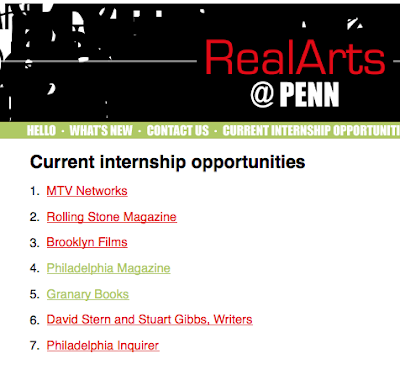 We created this program because we began to feel that the standard summer internship--especially in the arts--was exploitative. Orgs and companies want free smart help from college students desperate for a line on the resume and "real" "experience." An already bad trend has gotten worse because of the bad economy and because in newspapers and publishing there are the additional pressures of the changing "business plan." Our internships have been created each through a special partnership. Since we pay the stipend we are able to shape the process of selection (although finally the interns are chosen by the staff of the host entities). Klaus Barbie: "He took pleasure in it."